In this, the third in a series focusing on The Bachelor’s earliest days, I would like to highlight one of the young men who helped to found The Bachelor and who served as its first Editor-in Chief. Maurice Hale Brubaker, known to his friends as Hale, was born in Columbia City, Indiana in May of 1886. He graduated from the local high school in 1903 and secured a job with the Columbia City Commercial Mail, while he also held jobs at the local post office and taught school. This drive to achieve and his strong work ethic served him well and in the fall of 1905 Hale entered Wabash College. Seemingly always in a hurry, he finished in three years, despite a very busy on-campus schedule. Not only that, but he was also elected to Phi Beta Kappa. Looking back, over a century later, it appears that Hale was one of those young men who shine brightly wherever they go. The story of the founding of The Bachelor, in detail, may be found in the previous post. As you may read, several young men were present but I suppose it was not an accident that the founding meeting was held in Brubaker’s room, or that he led the discussion. The founding story also serves to show that in virtually every activity, he was a leader, a man trusted by his fellow students. No surprise then that he was The Bachelor’s first Editor-in-Chief. Fifty years later, one of those students remembered that of all of the copy that ran in the paper, Brubaker and another student, Ed Ziegner, wrote 90% of it. 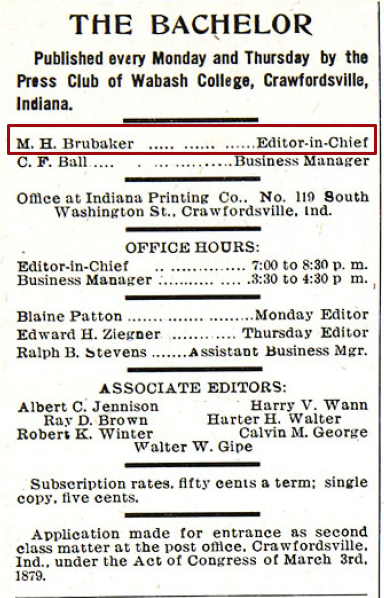 To show that Brubaker was acknowledged as a leader, not just at Wabash, but among his peers statewide, we have this item from The Bachelor of April 13, 1908 reporting on the Indiana Press Club’s Annual Meeting, “At the business meeting in the evening, officers were chosen for next year. Those selected were: A. L. Hawkins of Indiana, Pres. ; Paul Caldwell of Purdue, vice-pres. ; Edward Lockwood of DePauw, corresponding secretary; M. H. Brubaker of Wabash, recording sec. ; and George James of Indiana, treasurer.” One of five men to hold office statewide, Brubaker was once again chosen as a leader. This young man was a leader, he was smart, he could write, and it seems he had other talents as well. 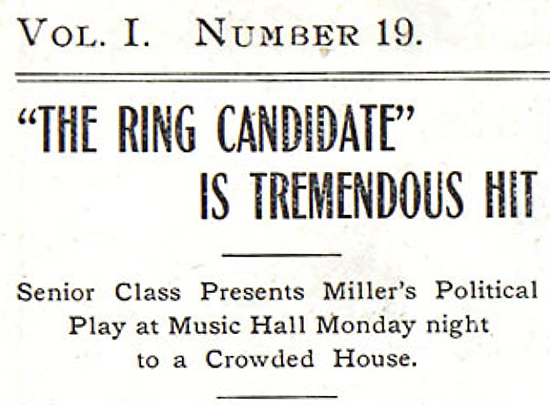 From The Bachelor of June 6, 1908 the theater reviewer, we assume not Brubaker, states unequivocally, “M.H. Brubaker, as John Dennell the “Ring” boss, was one of the best characters in the play. Mr. Brubaker was at ease and his enunciation was good. It would be hard to improve upon his portrayal.” Hale was a talented actor! And less we suppose that all of these activities caused his grades to slump, remember that he finished in three years and was elected to Phi Beta Kappa at Wabash. In addition, The Bachelor of April 4, 1908 adds to our portrait, “M.H. Brubaker and J.W. Macy have received scholarships in the law department of Columbia University.” Now we see a fuller picture of this remarkable student and his time at Wabash. Brubaker went to New York City and enrolled in the School of Law at Columbia. As he had done here on campus, Brubaker worked hard, joined clubs and helped out where he saw the need. 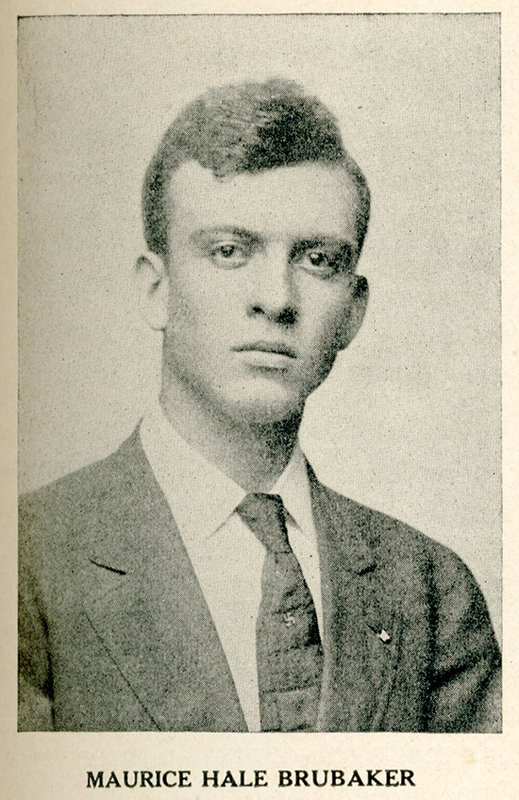 From The Bachelor of December 13, 1909 comes this story, “Maurice Hale Brubaker, ’08, who is attending the Law School of Columbia University, New York, is the business manager of The Civic Journal, a weekly put out by the People’s Institute of that city. The object of the organization and publication is the practical education of Americans in citizenship, the organization of civic clubs for young men and cooperation with all other organizations having similar objects… Mr. Brubaker had been working for the People’s Institute for more than a year past and was in a position to be useful to them in putting out the paper.” Indeed his experience on The Bachelor would have been tremendously helpful to this non-profit. The next time there is a mention of this most excellent young man, it too is on page one, written by the men who knew him best, his fellow Bachelor writers. In the edition of December 12, 1910 a column length obituary appeared with distinctive black bars top and bottom, which denote mourning. The column was a fairly matter of fact listing of his achievements and the pertinent facts of a life cut short. On page two of that same issue, in the editorial column below, there is more of a personal sense of loss. So cheers to The Bachelor of today, cheers to the founders and cheers to the journalistic legacy handed down from generation to generation. All those earnest young men working late at night, writing and editing away to pull the paper together by the deadline. And for over a century doing it all simply for the love of it and to give the students, faculty and staff of Wabash a paper of excellence.